Spear phishing is an email phishing attack that targets an individual or a particular organization, to gain access to confidential information or sensitive data. Spear phishing attempts are more likely to be conducted by convicts for acquiring trade secrets, financial data, or military information. Spear phishing protection is used to filter out all those unsolicited emails and protect an individual’s information from hackers. Factors such as the rising adoption of cloud email security solutions, rising number of cybercrimes in different end use industries such as banking and financial sector, defense, healthcare and retail sector, and rise in internet penetration across the world have led to the expansion of the spear phishing protection market. Moreover, rise in BYOD applications is one of leading factors responsible for the growth of spear phishing protection market over the forecast period. The spear phishing protection market, as a result, is expected to witness an increase in market growth between 2017 and 2025. However, lack of proper knowledge and awareness about cyber-attacks is anticipated to hinder the growth of the spear phishing protection market. The report states that the global spear phishing protection market stood at US$ 817.2 mn in 2016. 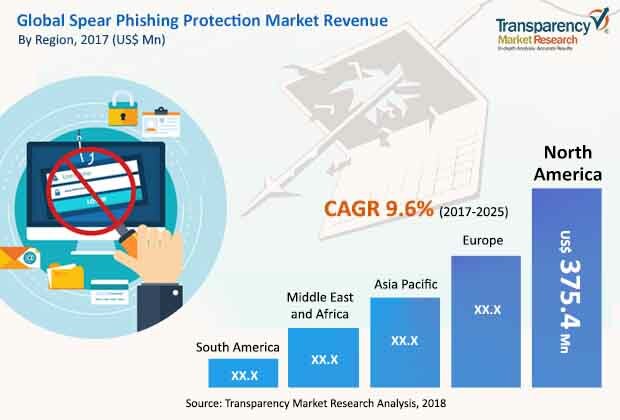 The study projects the global spear phishing protection market to expand at a CAGR of 9.6% during the period from 2017 to 2025, rising to a valuation of US$1,839.8 mn by 2025. Based on component, the spear phishing protection market is segmented into solutions and services. Solutions segment is further sub segmented into cloud, hybrid and on-premise. Cloud based solution sub-segment held the largest market share in the global spear phishing market in 2016 and is expected to see robust growth over the forecast period. The services segment is segmented into professional services and managed services. The professional services segment is estimated to account for a significant chunk of the market, followed by managed services during the forecast period. Rising number of cyber-attacks is expected to propel professional services demand over the forecast period. Managed security services is one of the most favored cyber security technologies, and is developing rapidly due to effortlessness operations and management in banking and financial sector, telecommunications, and healthcare. The global spear phishing protection market is expected to be driven by the North America region, followed by Europe over the forecast period from 2017 to 2025. Furthermore, South America and Middle East and Africa (MEA) are projected to promote the growth of the overall spear phishing protection market. Globally, North America region held the major market in 2016 and is expected to maintain its leading position in the spear phishing protection market due to huge investment by leading manufacturers in technological up gradation in cyber security protection system and wide product acceptance trends among consumers. Apart from this, growing incidences of cyber-attack from emerging economies such as China, Japan, India, and countries across South America is expected to drive the market over the forecast period. However, because North America and Europe are mature markets for spear phishing protection in terms of system awareness and acceptance, these regions are estimated to develop at a stable yet relatively sluggish pace over this forecast period. The key players profiled in the global spear phishing protection market include Microsoft Corporation, Symantec Corporation, BAE Systems, GreatHorn, Inc., Cisco Systems Inc., FireEye Inc., Proofpoint, Inc., Intel Corporation, Mimecast Ltd., and Phishlabs. This report on the global spear phishing protection market provides analysis for the period 2015–2025, wherein 2016 is the base year and the period from 2017 to 2025 is the forecast period. Data for 2015 has been included as historical information. The report covers market dynamics including drivers, restraints opportunities, and trends expected to influence the global automotive power electronics market growth during the said period. The study provides a comprehensive analysis on market growth throughout the above forecast period in terms of revenue estimates (in US$ Mn), across different geographies. The rising number of cyber-attacks across different end use industry specifically in banking and financial sectors, defense and retail & consumer goods sector has brought about a comprehensive usage of security protection against spear phishing. In recent times, many organizations are targeted with spam emails, data loss, and spam data among others. Spear phishing protection solutions and services are helping those organizations by filtering spam, email encryptions, email archiving and prevention of data loss. Rise in internet penetration and investment in data security in telecommunication, healthcare, government and public sector flourish the growth prospect for spear phishing market over the forecast period. Rise in demand for cloud email security solutions and services from the developing economies such as China, India, and the South American countries is expected to drive the market during the forecast period. However, lack of knowledge and awareness about cyber-attacks is anticipated to hinder the growth of the spear phishing protection market in different end use industry. The spear phishing protection market has been segmented on the basis of component, protection type and end use industry. Based on component, the market has been classified into solutions, services. Solutions segment is further sub-segmented into cloud, hybrid, and on-premises. In addition, services segment is bifurcated into professional service and managed service. On the basis of protection type, the market is categorized into data leak protection, email encryption, multi-layered malware protection, social engineering protection, zero day prevention and others. By end use industry, the market is further classified into financial services, insurance, defense, healthcare, government & public sector, retail and consumer goods, telecommunication and others. Geographically, the report is segmented into the spear phishing protection market into North America, Europe, Asia Pacific, Middle East & Africa (MEA), and South America; the regions are analyzed in terms of revenue generation. Furthermore, the study also includes quantitative analysis of the competitive scenario for region wise prominent countries which are covered in the report include the following - the U.S, Canada, Germany, France, the U.K., China, India, Japan, Australia, GCC, Brazil and Argentina. The market size and forecast for each region has been provided for the period from 2015 to 2025 along with the CAGR (%) for the forecast period from 2017 to 2025. The report also includes key industry developments in the spear phishing protection market. The report also covers segment wise, market attractiveness analysis and market positioning analysis for all regions covered in the scope of study. This report shows market attractiveness analysis for all the segments and for all the regions in the scope of the study which identifies and compares segments market attractiveness on the basis of CAGR and market share index. The report also includes competition landscape which include competition matrix, market position analysis of major players in the global spear phishing protection market based on their 2016 revenues, profiling of major players. Competition matrix benchmarks leading players on the basis of their capabilities and potential to grow. Factors including market position, offerings and R&D focus are attributed to company’s capabilities. Factors including top line growth, market share, segment growth, infrastructure facilities and future outlook are attributed to company’s potential to grow. This section also identifies and includes various recent developments carried out by the leading players. Company profiling includes company overview, major business strategies adopted, SWOT analysis and market revenues for past years. The key players profiled in the global spear phishing protection market include Microsoft Corporation,Symantec Corporation, BAE Systems, GreatHorn, Inc., Cisco Systems Inc., FireEye Inc., Proofpoint, Inc., Intel Corporation, Mimecast Ltd., and Phishlabs.